VIDEO: @888poker Ambassador Ana Marquez analyzes a hand she judges has only two streets of value. 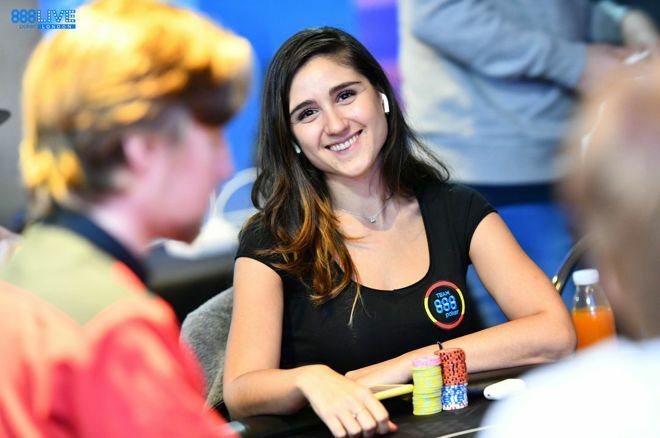 Hand analysis: Value betting with Ana Marquez at the @888poker LIVE Festival London Main Event. The £1,100 buy-in 2018 888poker LIVE Festival London Main Event is currently underway at the Aspers Casino, with the PokerNews' live reporting team on hand to bring all of the big hands, chip counts, photos, videos, and more. Among those taking part is 888poker Ambassador Ana Marquez. Marquez has accumulated more than $1.26 million in tournament cashes over the course of her career, a total placing her just inside the top 10 of the all-time earnings list for players from Spain. While playing her Day 1 flight in London, Marquez took time out to analyze a hand she played in which she managed to earn extra value by checking a postflop street to disguise her hand's strength. As Marquez explains below, a passive player opened from early position, and after she chose to three-bet from the button with A-10-offsuit her opponent called. A flop of three low cards missed her hand though left her still with two overcards, and when checked to she bet one-third pot and was called. An ace fell on the turn and her opponent checked again, and that's where Marquez chose to check back, her action motivated both by a desire to disguise her hand and by her understanding that she could probably only get two postflop streets' worth of value from it.